The St. Louis Blues celebrate a 4-3 win in Winnipeg against the Jets on April 12, 2019. The Blues lead the first-round playoff series 2-0. On a night where the Winnipeg Jets and their crazed fans were looking for change, the franchise took action. 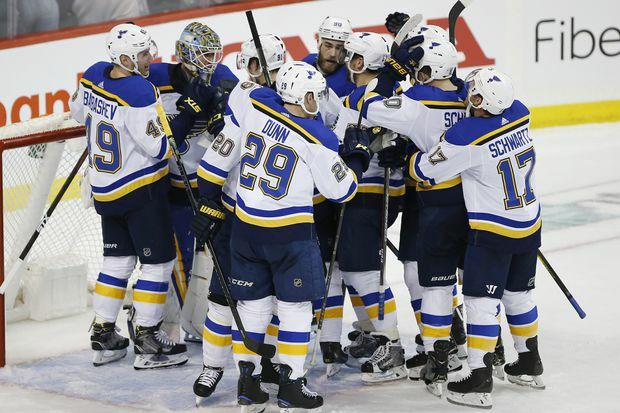 No way were they going to stand pat and let the St. Louis Blues, who had staged a come-from-behind 2-1 victory here Wednesday, take a 2-0 lead in games back to St. Louis for Game 3 on Sunday. Alas, the magic failed to take hold, as Blues captain Ryan O’Reilly scored in the third period to give St. Louis a 4-3 win. The Blues now head home with what is generally considered a stranglehold, leading two games to none in a seven-game series. Stacey Nattrass, who usually so capably handles the anthems, was a healthy scratch, her position taken by the Hoosli Ukrainian Male Chorus. The Jets were 5-0 when the Hoosli chorus sets up the “TRUE NORTH!” shout from the stands during O Canada, and did the honours back on March 23, when the Jets defeated the Nashville Predators 5-0, which many say was the Jets’ best performance of the regular season. Another change, perhaps more significant, took place on the bench. Winnipeg head coach Paul Maurice decided to insert the team’s Energizer Bunny, Brandon Tanev, back in the lineup as Tanev recently came off the injury list. The 27-year-old Toronto native is known not for his size – listed as 6 feet and 180 pounds – but for his speed and tenacity. That said, he did score 14 goals and 29 points this season and had four goals in the Jets’ postseason run a year ago. Tanev was all but vibrating as he met with the media before the game and barely coherent as he kept repeating himself about the the excitement of the Stanley Cup playoffs. He predicted an “electronic atmosphere,” though he stopped short of saying he would supply the charge. Maurice elected to start Adam Lowry’s line first, with Par Lindholm on one wing and Tanev on the other. They were up against the big Blues line of O’Reilly, Vladimir Tarasenko and Brayden Schenn. Predictably, first chance he got, Tanev slammed the closest Blues player into the boards. How ready the other Jets were to start Game 2 was an immediate question. Unlike Wednesday, when they dominated the opening period, this time they fell into a series of mostly dumb penalties. The Blues, as well, found the penalty box, and it was during four-on-four play barely five minutes into the game that the Blues found themselves on a two-on-one break after a Jets defensive miscue. Defenceman Jay Bouwmeester got the puck to centre Oskar Sundqvist, and as Sundqvist came over the Jets blueline, he calmly fired a wrist shot that eluded Winnipeg goaltender Connor Hellebuyck to put St. Louis up 1-0. More Jets penalties followed – at one point, the Blues had 17 seconds of five-on-three – but the Jets not only killed the power plays off they scored shortly after when centre Scheifele carried behind the St. Louis net and fed a slick pass to Blake Wheeler, who beat Jordan Binnington with a quick shot. The tying goal sent the sellout crowd into a frenzy with as many white-clad fans screaming outside the rink as in. Some 15,000 fans paid $5 a ticket to stand in the cold and stare at huge television screens. The money goes to charity. The Blues entered the match hoping to win for a second straight time in the intimidating Bell MTS Place. “We have to go for the jugular here and go back home up 2-0,” said St. Louis centre Robert Thomas after the morning skate. “We put ourselves in a good spot stealing one early in their rink, and we just want to keep on building off that. If we're able to steal two, that would be really good going back home. 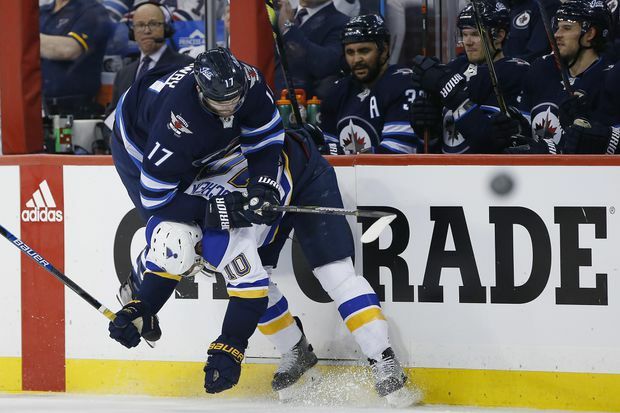 Winnipeg Jets center Adam Lowry is upended by St. Louis Blues centre Brayden Schenn during Game 2 on April 12, 2019. It was more physical and the Blues were indeed more prepared. So, too, were the Jets. Both teams torqued their play as the game moved along. Early in the second period, St. Louis defenceman Robert Bortuzzo took an interference penalty and, 19 seconds later, the Jets scored to move ahead 2-1 on one of their trademark goals when Wheeler fed Patrik Laine cross ice and the 20-year-old one-timed a hard slap shot past Binnington. St. Louis got that back quickly, tying the game at 2-2, when forward Pat Maroon got two swings at the puck in a goalmouth scramble and the puck ended up behind Hellebuyck. Hellebuyck then let in a very weak goal when Sundqvist was again left alone, this time in the slot area, and he fired a wrist shot through the five-hole to put the Blues ahead 3-2. But the Jets were determined. Late in the second period they went on the power play after Thomas took a hooking penalty. Kyle Connor sent a perfect pass to Scheifele and, unlike his chance late in Game 1, this time he easily beat Binnington high to the blocker side. O’Reilly put the Blues ahead once again, and this time to stay, less than four minutes into the third when he snapped a long wrist shot from the right boards and beat Hellebuyck to the far side. Time, it would seem, for some more tinkering.